I was toying with the idea of setting up an online shop and researched into the different e-commerce platforms recently. 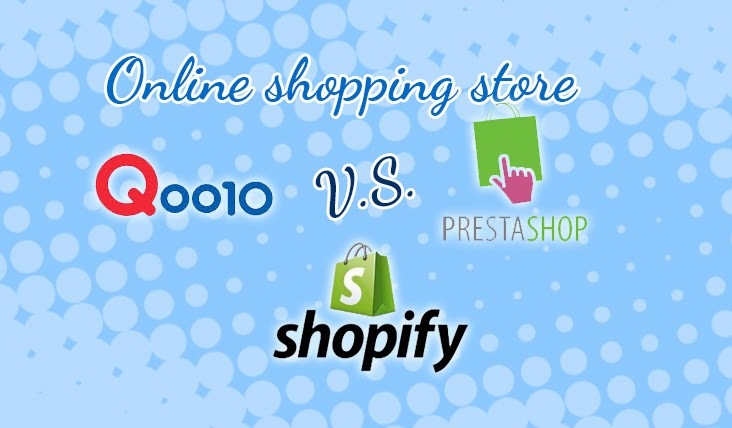 Assuming that you own a product or service, you can consider these three solutions: Shopify.com, Qoo10.sg and Prestashop. The transaction fee and marketing methods differ vastly, but they all provide a complete shopping experience. Let's go through the information I have consolidated and I will like to hear your opinions in the comments section. Shopify.com provides a shopping site: they will host your template design and handle your payment for you. You can customise your site in any way - the sky is your limit. In return, you pay a fixed monthly fee and a percentage of the sales amount. They launched in 2006 and have taken up many online advertising spots lately. The big tech site have applauded them for the clean sleek design and the ease of use. Qoo10.sg is online marketplace that gathers all the sellers on a single platform. Setting up your shop and listing as a seller is free. You also benefit from the crowding effect because customers know they can find everything in one place and they tend to return. Returning customers breeds familiarity and trust with the platform. The Qoo10 team earns the transaction fee of each sale you make. However, the transaction fee is steeper than Shopify (I will compare this in a moment). Qoo10.sg, formerly known as Gmarket, is a joint venture between Giosis and eBay. Prestashop is an open source e-commerce shop, hence it is free. It is meant the more techy crowd because you need to source your own web host, payment processor and install the application on your own. If you are starting an online shop for the first time, the challenges are daunting to go with this option: from choosing a reliable web host to linking up your shop to the payment processor. Overhead cost is an important factor in a business. This is on top of acquiring the product itself and it can mean the difference between making a profit or a loss. When the customer pays using their credit cards, you need a third party payment processor or a merchant account. Merchant accounts are used by the big boys. For a small e-commerce shops, it is more cost effective to use the third-party payment processor's merchant account to charge the client's credit cards.With Shopify.com and Prestashop, you need to choose your own payment processor (see list of recommended companies). A popular choice is Paypal because customers are familiar with Paypal and they trust the brand. Qoo10.sg simplifies this step for you by handling the transactions for you and charging a higher fee. The table below summarises the various charges. Prestashop has the lowest cost here. Depending on the third-party payment processor, you can lower the cost even further. Qoo10.sg is the costliest here, costing two times more than the Prestashop solution. Shopify takes the middle ground. Next, we look at the other crucial factors of choosing an e-commercial solution. * Update 6 Jan 2014: I previously said that Shopify handles the online transaction for you. After setting up a dev shopify shop, I found that I am wrong. You need to integrate with a third-party payment processor and I have updated the calculation above using Paypal. * Update 17 Jan 2015: Dave and Alex talks about their experience as Qoo10 sellers down in the comments below. I highly recommend you read them too. They have insights on non-payment, advertising and the tough competition with the top sellers. Shopify.com and Prestashop allows you to fully customise your shop. The smarter way to design your shop is to use an existing template design and make minor tweaks from there. 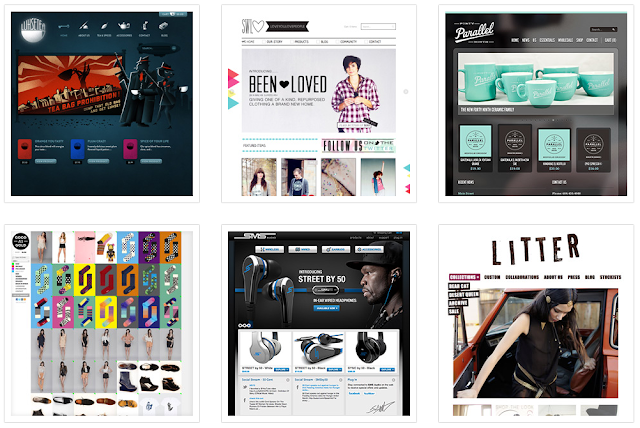 Shopify provides you with a catalogue of free template so there is no need for you to buy them. If you are looking for something different or if you are using Prestashop, you can buy templates from many online template stores. For example, I bought my blog's template from themeforest.net, called Quickly (it was USD $22 when I bought it). If you compare the demo site against my blog, you will see small changes here and there. Themeforest.net has templates for both Shopify and Prestashop. Themes generally cost between USD $40 to $70. The more complicated and beautiful the design, the higher the price. Shopify showcasing stunning web designs. This can your store. Shopify's shop design are generally clean and each item is featured prominently. It is ads free and your customers do not get distracted by your competitor's items. Qoo10.sg takes a different direction when it comes to designing your shop. They keep their branding and structure of the page. At the top, you have Qoo10 headers, followed by the product summary and price. After that, you are given unlimited vertical space to market your items. 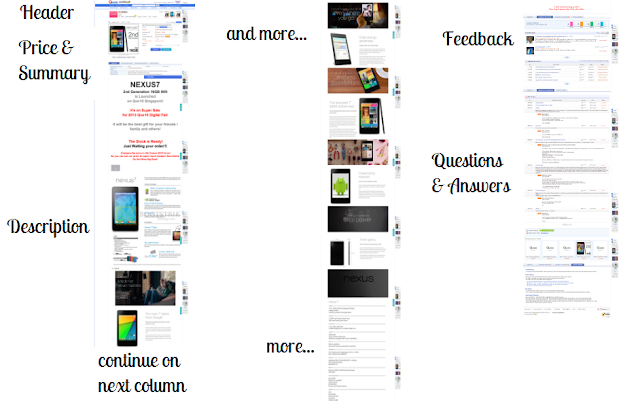 For example, this is a screenshot of a page selling Nexus 7. 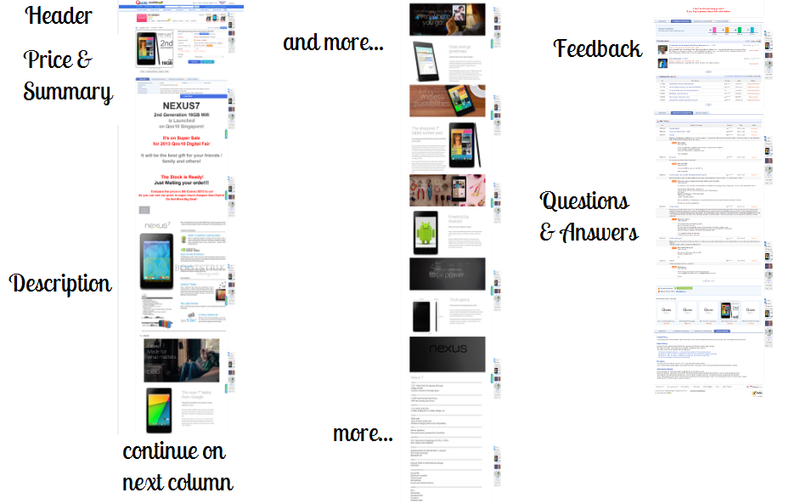 I broke the screenshot into multiple columns to show you how long it gets. This is not the longest page. You should check out the ladies fashion shops. After scrolling through something like 1.337 million pixels of impeccable models posing in dresses later, your mind is totally blown. Does this work? I think it does because an un-scrolled page is like you never finish walking through the shop and makes you feel like you could be missing on a nice item. Also, judging by the sales report of Qoo10 ($73 million in 2012), this is a winning formula for them. If you have a new product, branding is important. Presentation of your product is very important and shopify will be a better choice. You have your own domain name and personal shop design to leave a lasting impression. Shopify will give you $100 Google Adwords credit if you spend $25 in Adwords. Additionally, you get $25 in Facebook credit. These credits help you get started in paid search and ads placement. For example, if you want to advertise in Google search, you need to target keywords like handmade denim bags. And depending on intense the competition for the market is, bidding for those keywords can make up a substantial amount of your business. Based on my experience, paid advertising is the fastest way to get traffic to your shop. The same applies if you are using Prestashop. If you do not want to pay for advertisement but are willing to pay with your sweat, you can draw organic traffic from search engines. That requires your site to have good contents and you need mad skills in SEO (search engine optimisation). A good place to start learning about SEO will be searchenginewatch.com. With Qoo10.sg, you skim on the advertisement cost as the company does the marketing for you. From creating attractive photos to organizing sales, the sales team will help you to push your products because they have a vested interested in keeping the sales volume high. So if you are reselling a low-cost product like a USB cable in volume, Qoo10 is a better decision. Qoo10 plasters and cramps the website with deals and ads - you feel like you are going to flea sale to get cheap deals. If you are marketing a premium and unique product, your branding can take a hit as customers associate Qoo10 with low price and average quality products. I have examined the three platform as an outsider. Without actually buying into the platform, there will be hidden cost that I am unaware of. For example, how does the companies deal with customer charge back after delivery or return. I know that Qoo10 only release the payment when the customer confirms delivery of the goods. Therefore, the company favours the customers more. From what I read on Shopify site, they release the payment as soon as the customer has paid. Also, after all the payments are collected, how quickly the company settles the charges and pays you at the end of the month? Cash flow is important to a business. The three platforms have their pros and con's. I'm interested to know what you think. Which platform is better for the type of products you are selling? Are there other e-commerce platform worth considering?